The Case Management/Electronic Case Filing (CM/ECF) system is used to electronically file documents, open civil cases, and pay filing fees. 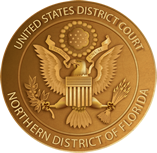 Filing of documents electronically via CM/ECF is now mandatory for all members of the Northern District of Florida Bar. Pro se litigants may not file electronically. Unless they are sealed or otherwise restriced by court order, documents filed electronically are immediately part of the public record. Attorneys are advised to review the privacy notice for guidelines on redacting sensitive information, prior to filing any documents in CM/ECF. A variety of training materials are available for attorneys who are unfamilar with CM/ECF, ranging from videos and tutorials about general CM/ECF concepts to a CM/ECF manual with information specific to the Northern District of Florida. A list of frequently asked questions about CM/ECF is also available.